Following Julia Hines’ Big Local perspective of empowering communities at risk of knife crime and gang violence, Paul and Sian offer four key ways community development approaches can help empower communities affected by these issues. 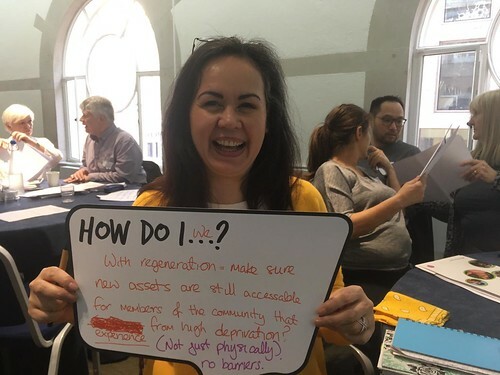 By Paul Bragman and Sian Penner, Big Local reps. Paul Bragman is a member of the Empowered Communities in the 2020s steering group. We are living in times where turbulence is the new norm and parts of our communities feel increasingly pressured by everyday life. There is a growing lack of trust between communities and agencies, exacerbating feelings of insecurity and isolation. In addition, there has been a withdrawal of local services, and a growing gap between ‘decision makers’ and those whom decisions are impacted on. So how does empowerment work with people who are increasingly feeling under siege? Or has community development become part of an ‘industry’ that comes in and ‘does to’ and then leaves when funding runs out? Or is it a quick fix for the aftermath of a riot or a disaster? Do the notions of ‘talking shop’ with the ‘usual people’ that meet for discussions, often with very little action, perpetuate the feelings of disaffection? Can we really empower communities when wider public services continue to contract and are cut throughout the UK? With shrinking public services and increased funding challenges, there is now a steadily increasing need for communities to ‘fill the gap,’ especially in reducing group and gang related violence. How can we think more radically about how community development can support communities to empower themselves and support them to build their confidence to step up to this challenge? For a community affected by group and gang violence, empowerment is the ability to feel safe, to trust and not fear services locally; to access services when needed and ‘voice’ when services don’t work properly. Empowerment for the individual in this community is the ability and confidence to re-connect and embrace neighbours, embracing difference in others and working with them. Acknowledgement from statutory partners that they need to work differently. A willingness to listen and learn, an openness and lack of defensiveness, and strong local leadership to work with communities as trusted and equal partners at all stages of the process. Provide a transparent and accountable approach to funding. Empowered Communities in the 2020s can step up to this challenge, however there is a growing need for investment in grass roots community development in neighbourhoods most affected by group and gang violence. This will include time to ‘grow’ local responses alongside community responses to building trust and connections. There is a critical need at this time to provide targeted community development support for local communities to reduce group and gang violence; embedding development skills and facilitation in residents as an essential building block to develop robust intelligence, resilience and partnership responses to group and gang violence; independent unbiased facilitation brokering partners and communities together to work to understand the benefits that partnership working bring to all stakeholders.